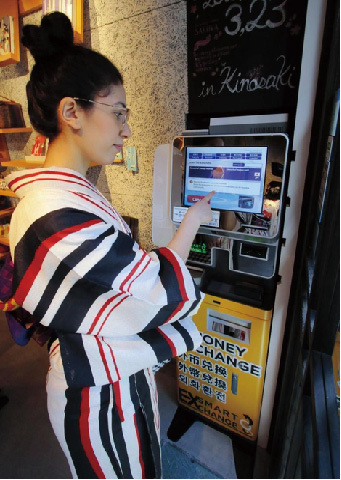 TOKYO--(BUSINESS WIRE)--ActPro Co., Ltd installed approximately 400 units of SMART EXCHANGE automated currency exchange machine which can exchange 12 foreign currencies in Japan, in just 2.5 years. The automatic foreign currency exchange machines made in Japan are the world’s best, enabling currency exchange through simple to use touch panel operation and no longer need human labor. In 2017, the number of foreign visitors to Japan broke the record and reached to 28.69 million as the result of the effort by both the public and private sectors. A phenomenal growth of 461% in the last 6 years, since 2011. It is confirmed foreign tourists to Japan has exceeded a record 30 million people in 2018. The number of overseas travelers in the world has exceeded 1.3 billion, a record high and is projected to reach 1.8 billion annually by 2030; UN (WTO) forecasts that the share of emerging countries will be 57%. ActPro is currently developing an automatic foreign currency exchange machine to resolve the inconvenience experienced by travelers. As first step, from the Autumn of 2018, ActPro Co., Ltd seeks business partners in Southeast Asia, Europe, America, Russia and other countries.